It’s Thanksgiving weekend, and that means a pumpkin ale review. I have a couple of different pumpkin ales in the fridge right now, but the only one I haven’t reviewed before is Pumpkin Ale with Spices from Foothills Brewing of Winston-Salem North Carolina. Tee nose has pumpkin, caramel and a hint of nutmeg. The middle is rich and fairly dry with pumpkin, nutmeg, cinnamon and allspice. A bit of sweetness comes out in the finish to really round out this pie style pumpkin ale. The body is medium and the alcohol is a moderate 5.7% ABV. This is a great beer choice to complement any autumn occasion. This entry was posted in Reviews and tagged Ale, Foothills Brewing, Fruit Ale, Fruit Beer, North Carolina, Pumpkin Ale, Spiced Ale on November 23, 2018 by Xander. Sierra Nevada has expanded east, and to celebrate the opening of their new brewery in Mills River, NC, they released Rain Check Spiced Stout. Though released in summer and tasty any time of year, this has all the flavors of a classic winter treat with chocolate, ginger, cardamom and cinnamon coming through and just a hint of citrus. This is a sweet beer from start to finish, with the flavors transitioning from sweet and spicy in the middle to sugary at the end, with brown sugar and caramel notes, and a bit of root beer right at the end. It’s wonderful to see the success of a great brewery like Sierra Nevada lead to an expansion like this, and this was a great brew to celebrate the achievement. This entry was posted in Reviews and tagged Ale, California, North Carolina, Sierra Nevada, Spiced Ale, Spiced Stout, Stout on February 25, 2015 by Xander. So I lied. Or was at least mistaken. I said last week that my review of Samuel Smith’s Winter Welcome Ale was going to be the last winter seasonal review of the year, but now I’ve found a can of 21st Amendment Brewery’s winter seasonal, Sneak Attack hiding in my fridge. 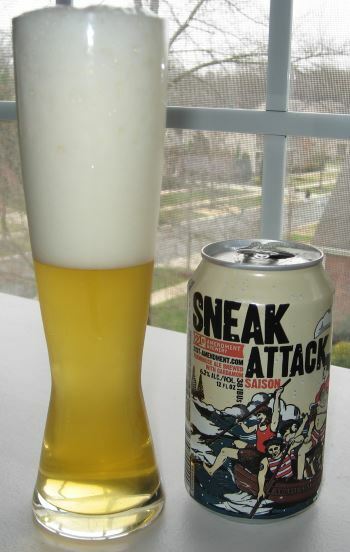 I guess that’s exactly what I should expect of a beer named Sneak Attack. Sneak Attack is a Saison, which is a really nice style to welcome in the spring, so it’s probably fortuitous that it gets to be my actual last winter seasonal review of the year. As you can see from the picture it pours with a massive head of light meringue-like white foam that sticks around for a bit, but will disappear after a few minutes. The nose is scented with herbs, grass, and yeast. The middle is tart, with herbs again, as well as lemon. The finish is dry and woody with a bit of lemon zest. 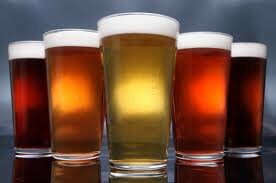 The body is medium weight, and the alcohol is a reasonable 6.2% ABV. At any time of year this is a nice solid Saison. This entry was posted in Reviews and tagged 21st Amendment, California, Farmhouse Ale, Saison, Seasonal, Spiced Ale, Winter Seasonal on March 18, 2014 by Xander. 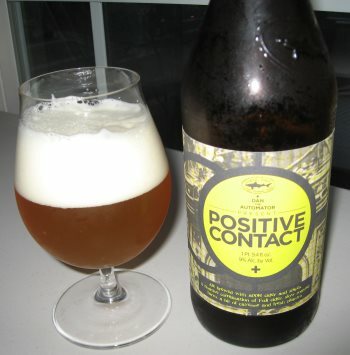 Positive Contact is another of Dogfish Head’s occasional musically inspired collaborations, this one with Dan the Automator of Deltron 3030. 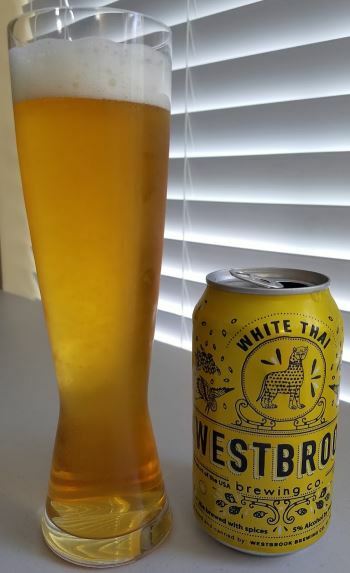 It’s a hybrid wheat ale and cider with spices that aren’t typical with either, such as cayenne pepper and fresh cilantro. With that variety of inputs, I wasn’t exactly sure what to expect but the result is excellent. All the components show well, and none are overpowering. The nose is distinctly Belgian yeast, with some apple notes in there. The middle is bready with quite pronounced wheat characteristics that are balanced by strong apple flavors that are moderately, but not excessively sweet, and also not quite as complex as they might be. The wheat comes back powerfully to give it a drying finish, and this is where the spices start to come though as well, adding peppery and herbal notes before fading back to apple. This reminds me most of a pre-hop spice beer, and is refreshingly unusual. It’s a medium bodied beer, and pretty big on the alcohol at 9.0% ABV, but you’d never know it because it hides it well. My bottom line is that this is an excellent off-centered ale. This entry was posted in Reviews and tagged Delaware, Dogfish Head, Fruit Ale, Fruit Beer, Seasonal, Spiced Ale, Wheat Ale on December 27, 2013 by Xander. I’ve previously reviewed Unibroue’s Apple variant of Éphémère, but tonight’s bottle is brewed with Black Current juice, Coriander, and orange peel. The result is a fruity beer that’s delightfully unsweet. The frothy champaign-ish head gives it a fizzy, carbonated texture, and there’s not much of a nose. The middle is spicy and heavily current flavored, but there’s an unusual lack of sugar that pegs the profile of this beer solidly in the “spiced ale” camp. It’s a medium bodied ale, and quite dry. The finish rounds out with some notes of plum, but again, without sweetness. Éphémère Cassis is a very unusual and enchanting brew. This entry was posted in Reviews and tagged Belgian Ale, Canada, Fruit Ale, Spiced Ale, Unibroue, Wheat Ale on October 29, 2013 by Xander. 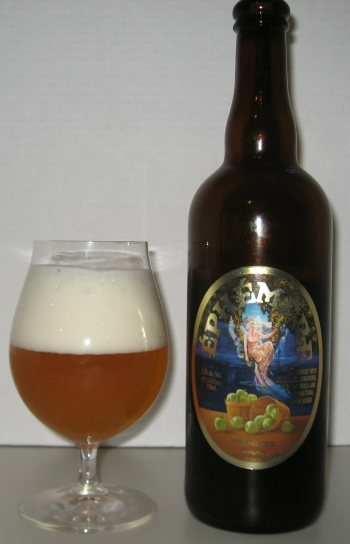 Éphémère Apple is a white ale brewed with apple must, curacao peels, and coriander from my favorite brewers in Quebec. The first thing that strikes me is that it isn’t sweet. This is not a cider-y apple beer, or a dessert-wine-like fruit beer. There’s definitely some strong apple flavors, but none of the sugars to speak of. The first flavors on my tongue are apple peel and coriander, and there’s some strengthening citrus notes towards the finish from the curacao. There’s an malt backbone throughout that’s understated as wheat usually is. This is a really nice, different fruit beer. Well worth a try if you enjoy Belgian lambics, or other fruit-based beer. This entry was posted in Reviews and tagged Belgian Ale, Canada, Fruit Ale, Spiced Ale, Unibroue, Wheat Ale on March 22, 2013 by Xander.